Recently, Canon introduced the EOS 350D (also called the Rebel XT) as their entry-level SLR replacement to the EOS 300D. 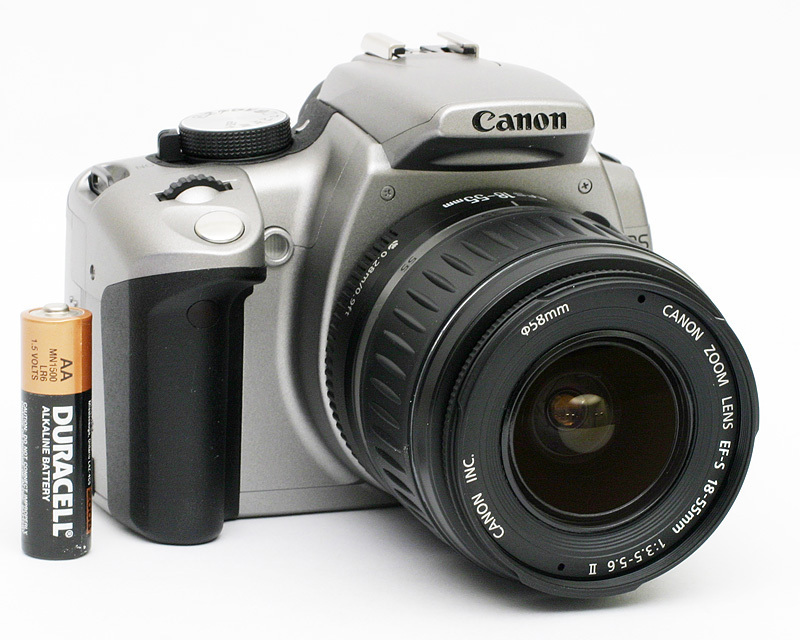 Although our review model is silver and black, an all black model is also available - giving the camera a more professional appearance. The new Rebel has a large 8 megapixel sensor that can shoot images as JPEG or RAW files. Other than the higher resolution, some of the exciting upgrades include a smaller and lighter body, ultra-fast DIGIC II image processor, larger buffer, selectable metering and AF modes, and Custom Functions. In fact, the 350D has so many improvements over the 300D that it actually shares more in common with the prosumer EOS 20D. Given that so many people are casting aside their fixed lens point-and-shoot cameras to venture into the digital SLR world, we thought that it would be well worth a look at one of the most popular options. In our review, we found that the 350D acts nothing like an entry-level camera. It has an instant startup time just like the 20D and its cycle/write times are nearly identical. The 350D is capable of capturing extraordinary detail and offers several parameters to adjust the in-camera processing levels. In our noise test, the 350D shows impressive noise control and produces surprisingly clean images throughout the ISO range. Read on for a full review of this remarkable camera to see why it might be your first digital SLR. * All image tests are performed with the use of a Canon 50mm Macro lens unless specified otherwise.